Would you like to support sustainability projects in schools? On Friday 24 of May, we will be holding a Dragon Den style event where secondary schools in Camden will be presenting their sustainability project proposals with the aim of sharing ideas and pitch to local business for support. 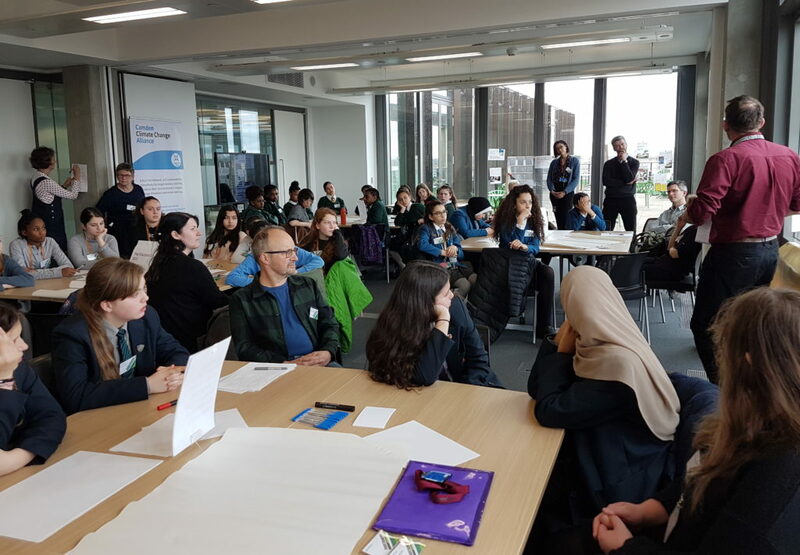 Early April saw the launch of the new sustainability steering group for students of year 8 and 9, The Sustainers, with the inspirational support and encouragement of Rob Hopkins, founder of the Transition Town movement in the UK. In his closure speech, Rob said: ‘It is inspiring to see what you are starting here and I really look forward to coming back in a year to see what has come out of this exciting new initiative. You can do anything, you can change the world around you, even if everyone says you can’t’. This pupil-led steering group will have two key responsibilities, contribute to the identification of local environmental priorities as well as potential solutions and, take a lead on the development of a sustainability project(s) in their schools and the local community. The project is being delivered in partnership with Transition Town Camden and will be trialled for one academic year with the involvement of six schools, these are Acland Burghley, William Ellis, La Sainte Union, Parliament Hill girls school, Haverstock and UCL Academy.